Game Description: After a cataclysmic event that broke the surface of the Earth, humanity survived in city-states on floating islands. In Leviathan, the most brutal of the city-states, Arlo is learning from his brother Marcus the ways of the scout, including wall running, wall jumping and mostly importantly how to use a grappling hook. In such a world, it is important for cities to send scout to survey the movement of other groups of people and potential resources to salvage. The grappling hook takes a prominent role in the gameplay of From The Ashes. As a first person platformer, the gameplay of From The Ashes is primarily about traversal and navigation, hence the lack of any enemies. In order to make traversal fun and rewarding I decided to focus the gameplay around the grappling hook. Though the player has numerous mobility options, the grappling hook is by far the most versatile and rewarding to master. By successfully shooting at an object in the level, the player can propel himself and swing over and under everything. In order to create as organic gameplay as possible, the grappling hook is not limited to attaching to certain objects. This gives the player the agency to make his own path, even in more linear levels, by choosing the objects to swing off of. Additionally, the grappling hook will attach to moving objects as well, adding the object's velocity to the player's own. As a designer, I have more than enough control over the player experience simply by placing the geometry of the level and scripting any events such as moving platforms. More is lost from the player experience by removing their ability to hook on anything than is gained from a stricter authorial control over the experience. Because the grappling hook gameplay in From The Ashes is so different from other games, it was important to effectively tutorialize the player to it. 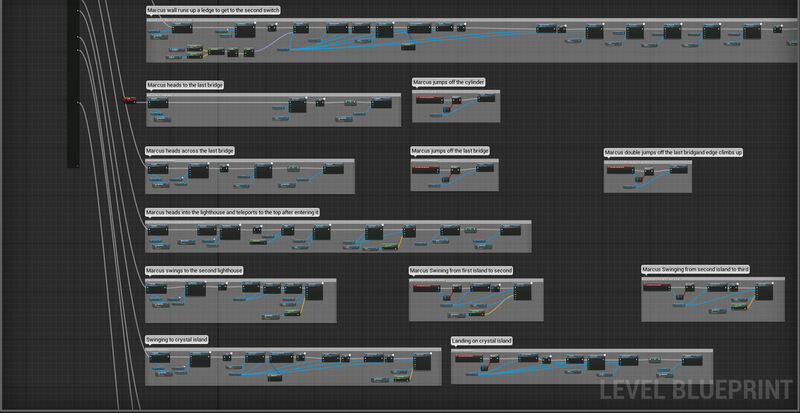 However, I didn't want to bore the player with long lines of text or lengthy tests. Therefore, I set the tutorial to be when Arlo, the player character, was taught how to be a scout by Marcus, his brother, making the tutorial canon instead of an abstraction. This also allows the player to see the actions correctly performed before being required to do them. From a level design standpoint, I first had the player hook to several immobile islands between a pair of lighthouses that act as landing points. Initially I thought that was satisfactory but I found that without any previous experience using the grappling hook, players would undershoot and get stuck underneath the lighthouse. In order to help these players, I added multiple 'stepping stone' islands surrounding the lighthouses to catch players who didn't quite make it on top of the lighthouse. From here players could easily swing from one 'stepping stone' to another and make it back to the top and continue the level without needing to die. Multiple islands around the lighthouse act as 'stepping stones' for people who failed to reach the top. In order to maximize the sensation of speed while moving through the world, I spent a lot of time including acceleration in every way the player moves. Acceleration is important because people don't feel velocity. Assuming there is no friction and you closed your eyes, you would feel as fast in a car driving at 30 miles per hour as you would in a plane flying at 300 miles per hour. The only way you can tell if you are moving is by feeling other forces based on acceleration, such as friction, or by looking at stationary objects and deducing your speed relative to them. While players don't feel themselves accelerating in video games the same way they would in a car, there is still a powerful sense of speed when they continuously accelerate and blow past objects in the world. This idea can be seen in games as old as Sonic The Hedgehog that put a pronounced focus on either speeding up or slowing down, creating a gameplay narrative that is largely focused around the player's current speed at any point in the level. The running system in From The Ashes is inspired by Mirror's Edge in order to make the player feel like he is running and accelerating forward instead of being a floating camera with a flat speed. The player starts at a medium speed, allowing them to reposition on platforms easily without over-correcting and falling off. As they continue moving forward without turning excessively, they accelerate and cap at a maximum run speed. However, if the player were to land on the ground above their maximum run speed, the bonus speed above the maximum would be initially maintained and slowly deteriorate over time unless the player does something to accelerate themselves again. Players accelerate when running until they reach a maximum speed. When a player lands above the maximum speed, they decelerate to their maximum speed. 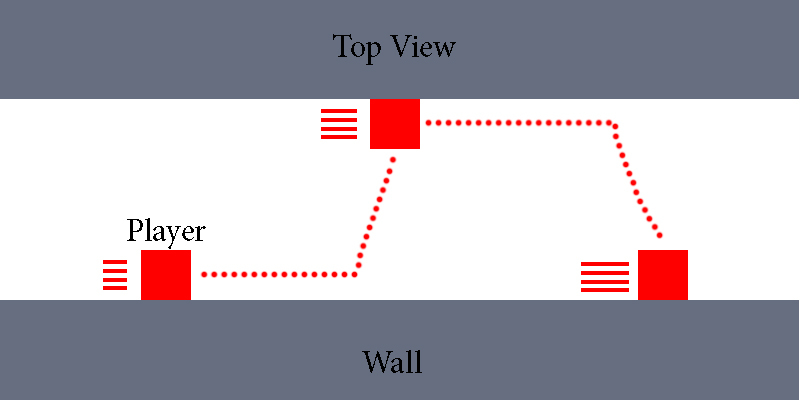 Like the game's other systems, wallrunning also includes acceleration to create a sensation of speed. When the player initially connects with a wall and begins to wallrun, he gains an instantaneous burst of speed that helps propel him along the wall. As he continues wallrunning, he loses speed and will eventually fall off of it. This encourages players to wall run, jump off of it onto another wall and continue chaining abilities to maintain their speed. By forcing players to act to maintain their speed, this system prevents players from boring themselves by creating a dominant strategy that isn't very interactive. As the player wall jumps back and forth, he gains speed. Unlike Running and Wallrunning, acceleration is inherent to swinging and didn't need to be added after an initial implementation. Because acceleration is a vector quantity and not a scalar, simply moving in a circular fashion causes acceleration, even if the speed of motion is constant. Additionally, when the player lets go and shoots into the air, gravity takes its due course and slows the player down until they start descending and speeding up. This naturally creates moments of higher and lower speed and encourages players to constantly look for targets to attach to in order to maintain their high speed without plummeting to their death. The player begins by attaching to an island and accelerates through the swing. Once the player lets go, they decelerate until they reach their vertical peak at which point they begin to accelerate once more. At the end, the player grapples to another island and begins the process once more. One of the most important things to consider when designing From The Ashes was to create a movement system that was simple in its input but complex in the result of the input. It's not fun to be unable to perform the basic mechanics in any game. For example, it is easy to shoot in Counterstrike but difficult to accurately shoot at moving targets. In Gran Turismo, it is easy to drive but difficult to efficiently navigate the tracks. Borrowing from this fundamental idea, I designed the controls of From The Ashes to be easy to move, swing and jump but difficult to do it expertly. The game only has a few button actions: move, jump, interact, shoot grapple and reel in grapple. It is the combination, timing and placement of these abilities that separates newer players from more experienced ones. In earlier versions there were more buttons that enabled more complex maneuvers that created interesting gameplay, but made it far too difficult for new players to perform the basic functions of the game and made the controls feel like alphabet soup. The player character automatically attaches to walls and grabs ledges when conditions are appropriate. Ensuring that these conditions actually felt appropriate required tons of playtesting and iteration. Since From The Ashes is a platformer, I felt it was important from the beginning that the player learned by doing, not from reading. Fundamentally, platformers are a high-action genre and appeal to players who want to do cool things in games, not simply read about them. Therefore, I decided to have the player character's brother show him the ropes in everything to do with being a scout. Before each new activity, he briefly tells the player what they are going to do, how to do it and then proceeds to do it. In addition to being a quick way of teaching players, it is fun to watch someone else maneuvering through the level. Clear player experience goals: From the beginning I had a clear idea in my head of how I wanted players to move through the level and how mechanically intensive various tasks should be. Team dynamics: Because all of our members had worked with each other in the past without problems, there were no social politic issues to deal with. Reacting to player feedback: The more mechanically intensive a game is, the worse developers are in determining how accessible the game is. It was important for me to get a lot of feedback and understand the core reasons behind criticisms. I was able to get the feedback and respond to it constructively, resulting in a final product with smoother controls and physics. Mismanaged pre-production time: We set aside a substantial amount of time for pre-production in the hopes that once we started production it would make the process smoother. Unfortunately, we spent too much time on things that ultimately had a minor impact on the player experience. Since we only had time for a single level, we ended up creating a lot of story and characters who never made it into the game. Poor communication with art: Because our team members have worked together in the past, we found that we didn't need to constantly talk to each other in order to get work done. However, this meant that I was often out of the loop on progress, especially with regards to art assets. I didn't know when things would come in and whether they would have proper collision and so on. I only realized too late how overscoped my design was in terms of the art it required to be completed. Late iteration on core systems: I spent most of the early development time documenting and building my level and testing gameplay motifs while I waited for the programmer to finish a first pass on mobility systems. However, I should have been more involved to save rework time as we added more acceleration to most of the systems. Pre-Production time needs to be prioritized: Simply having Pre-Production doesn't entitle you to a better development cycle. It must be spent on what matters. If a game's story is only tangentially important to the overall experience, then most of the pre-production time shouldn't be spent on it. Depth is irrelevant without accessibility: If a game is so difficult to get into that players give up in 15 minutes, then it simply doesn't matter how deep a game is. Depth is only important once players are invested and enjoying your game at a basic level. Therefore depth is not an acceptable replacement for accessibility to a game. A good game idea can always have both. 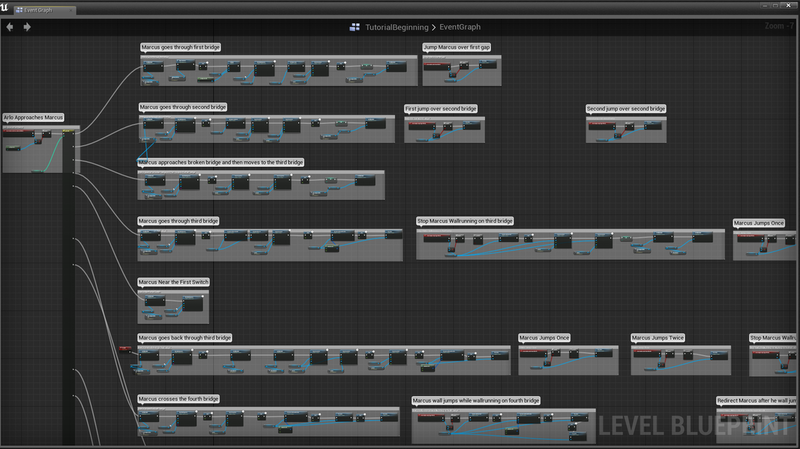 Keep tutorials simple: While most levels exist in a game to be fun, tutorials have a more functional purpose to them. In order for tutorials to teach players as effectively as possible. they should be simple. Save more complex and interesting level motifs for later levels. If the game is fundamentally fun, then players shouldn't get bored in a quick, simple tutorial.